As technology has continued to improve and bring with it many more efficiencies thermal cameras for your iPhone and Android device have become a viable option for many applications. The two main players in this space are FLIR and Seek with each manufacturer having multiple models to choose from. Below are some of the main differences between each of the thermal cameras and which one might be best for your needs and budget. You can also view our homepage for other thermal imaging cameras and reviews. You can use the Table of Contents below to quickly get the information you need on FLIR ONE and Seek Compact Thermal Cameras. We have placed the comparison table first so that you can quickly see the differences between the cameras and models. Will My Phone/Tablet Work With The FLIR ONE? What Is The FLIR ONE Range And Resolution? FLIR ONE vs FLIR ONE PRO - What Are the Differences? Will My Phone/Tablet Work With The Seek Compact? Seek Compact vs Seek Compact PRO - What Are the Differences In Models? What is the Seek XR? What Can I Use My Thermal Imaging Attachment For? Now that you have seen the specs for each camera which one is right for you? While everyone’s situation is different depending upon what is the most important factor in your buying decision we have put together some simple guidelines to help you below. If you are still unsure going through our quick list then all the detailed information about each model is below. FLIR and Seek are companies that specialize in thermal imaging hardware and software for commercial and residential use. FLIR is older having been established in 1978 and has continued to innovate within the space now having a thermal imaging solution for virtually every industry and use case. One of FLIR’s most revolutionary innovates is their MSX technology which overlays thermal imaging into standard images resulting in high resolution and detail. FLIR’s warranty (2-5-10) is also industry leading; buyers know FLIR stands behind its products and builds them to exacting specifications. Seek while a much newer company, founded in 2012, has industry veterans leading it and approaches the space from a much more narrow but focused view than FLIR. Also of interest, is that the founder of Seek (who is a serial entrepreneur) has sold prior companies he has built to FLIR. Seek focuses exclusively on the consumer market which has allowed it to devote all time and capital to making their products the best they can be; although they do not have the resources that FLIR does. Recently, Seek has started developing thermal imaging cameras for security and law enforcement use. The FLIR ONE now in its 3rd generation remains the most affordable thermal imaging camera in the FLIR line up. This is a break through product that takes the price point just around/under $200. To compensate for a fairly low thermal resolution (80x60 pixels), FLIR One is equipped with its own visual camera (1440x1080 resolution) and uses a combination of thermal and visual camera to create one easy to understand HD picture. You can set the camera to display only the thermal image but because the thermal sensor resolution is so low it is always better to have MSX enabled. The updates made to the FLIR ONE Gen 3 make it the best choice based on price UNLESS you need to detect higher tempatures which the Seek Compact will let you do. The FLIR ONE is powered by its own battery which is good enough for up to 1 hour of operation time, and takes around 40 minutes to charge. If you are looking for a cheap thermal camera with good image quality, the Flir One does the trick thanks to the combination of HD visual camera and thermal camera. Again, remember that the FLIR ONE phone attachments have their own separate battery that must be charged and do not run off your phones battery. These models are available for iOS devices, Android Micro USB as well as the new USB-C standard. High resolution thermal sensor companies with the same HD visual camera gives you much clearer images. For those of you looking to buy a thermal imaging camera for professional use the FLIR ONE PRO is a great choice! The Seek Compact thermal imaging camera is Seek's entry level cell phone attachment. The main differences between the Seek Compact and its FLIR ONE competitor are that the Seek Compact only has a thermal imaging camera and no visible light camera. The Seek camera also has a manual focus which allows you to fine tune to focus on the specific areas you want to however it is not a quick as the FLIR ONE’s fixed focus. Additionally, the Seek Compact (and PRO) are powered by your phones battery and do not have a separate battery to charge. This is both good and bad as you do not have to worry about carrying two chargers but depending upon how much you use your phone and the Seek attachment you may deplete your phone's battery quicker. The Seek Compact has higher temperature detection rage (-40°F to 626°F) and a higher native thermal resolution, both significantly higher than the FLIR ONE. However, the FLIR ONE's MSX technology does help to deliver a sharp image. 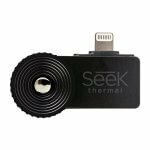 Ultimately, the edge for entry level thermal camera (not for commercial use) goes to the Seek Compact if you need a higher temperature detection range and smaller form factor. If you need clearer images and don't mind a slightly bigger camera the FLIR ONE is a better choice. The Seek Compact PRO is the premium thermal imaging attachment for phones and tablets and competes directly with the FLIR ONE PRO. Just as with the Seek Compact the CompactPRO only has a thermal imaging camera and no visual camera built in. However, a thermal sensor with 320x240 resolution, wide temperature detection range of -40F° to 626°F and fast 15Hz refresh rate make CompactPRO a bargain among thermal imaging cameras. A similar standalone device will cost you hundreds if not thousands more. if you like the convenience of using your phone battery to power the device and want higher resolution thermal sensor vs built in visual camera, go for the Seek CompactPRO over the Flir OnePro. Most modern iOS and Android devices will work with the Flir One attachment. Recently, Flir updated the line by adding USB-C compatibility which is used by the latest Android phones. You can find the complete compatibility list for FLIR ONE cameras on their website. Two of the most common questions are what is the range of the FLIR ONE as well as what is the resolution? On a clear day with good weather you should be able to detect a person over 400 feet away provided you have a clear line of sight to them. If you are trying to spot large animals, you might be able to detect them further out. The minimum distance is 12 inches. While this detection range is not as long as the Seek Compact the reality is almost all of the time you will not be trying to detect people or animals outside of this distance with this type of thermal camera. The resolution of the FLIR ONE is a combination of the thermal imaging camera which is only 80x60 in the FLIR ONE and 160x120 in the FLIR ONE PRO combined with the visible camera resolution of 1440x1080 in both models. FLIR’s MSX technology allows the lower resolution thermal image to be overlaid on the higher resolution visible image resulting in a surprisingly clear HD image. If you have decided to go with a FLIR Thermal Imaging Camera you now need to decide which model, you are going to go with. The main differences between the FLIR ONE and FLIR ONE PRO are the PRO’s increased thermal resolution, higher temperature detection range, increased FOV and ability to view thermal image only. The higher thermal resolution of the PRO is 4x the resolution of the standard model and produces even clearer images. The pluses justify the extra cost and if you are looking to use the camera in semi-commercial and commercial use then the FLIR ONE PRO is the way to go. For home owners and hobbyists who are looking for the most cost effective thermal camera the FLIR ONE is an excellent choice at a great price point. Like the Flir one, Seek Compact series are compatible with most IOS and Android devices. The latest Samsung phones that have USB-C input, will need to have an adapter, since Seek Compact does not yet have a native USB-C output. Also, there are some Android devices that have side input, and will need to have an adapter also. The main difference between the Seek Compact and Compact PRO is the PRO’s higher resolution, greater detection difference and more sensitive thermal sensor. While these upgrades increase the price, they do make the Compact PRO more suited to commercial and business use; while the Seek Compact is aimed more at the do it yourself crowd and the occasional hobbyist. The Seek Compact and Seek PRO are both the sames size. The Seek XR has the same specifications and LOOKS THE SAME as the Seek Compact except the XR has a narrower field of view (20 degrees) so that you can get almost double the viewing distance - 1,800 feet versus the Seek Compact's 1,000 feet range. Electrical Inspections – Locate Unbalanced Loads in Wall Switches/Outlets.